The Gulf of Mexico region: large, diverse, and in trouble. The United States coastline bordering the Gulf of Mexico is 1,631 miles long and provides habitat for more than 15,000 species of plants and animals. Sixty-five rivers flow through Alabama, Florida, Louisiana, Mississippi, and Texas to the Gulf of Mexico, creating a complex of estuarine environments that serve as nurseries for recreational and commercial fisheries. The region supports an array of diverse ecosystems – mangrove forests, salt marshes, barrier islands, bottomland hardwood swamps, wet pine savannahs, and many others. Each state has its own unique landscape with unique challenges. Alabama’s Dauphin Island serves as a key feeding and stopover site for migratory birds. 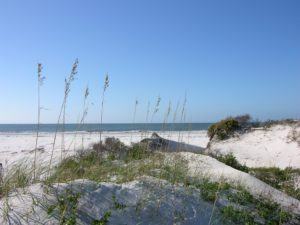 Florida’s sandy beaches and dune systems provide vital nesting grounds for loggerhead sea turtles. Mississippi waters offer important spawning and feeding habitat for the threatened Gulf Sturgeon. 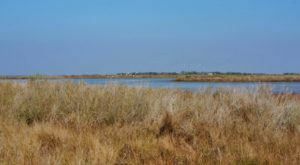 Louisiana is battling the on-going loss of wetlands throughout the Mississippi River Delta. Since the 1930s, Louisiana has lost over 2,000 square miles of land, an area roughly the size of Delaware. Texas is home to Laguna Madre, one of only six hypersaline lagoons in the world and essential habitat to the endangered ocelot. There are also region-wide trends across the Gulf’s five states that are threatening the broader landscape. More than 50 percent of Gulf Coast wetlands have disappeared since 1780, and the region continues to lose wetlands at a faster pace than anywhere else in the United States. Like many coastal areas in the U.S., open space is steadily lost to development. The farms of America’s heartland send fertilizer, sediment, and other pollutants downstream to the Gulf, feeding the second-largest hypoxic dead zone in the world. The entire Gulf Coast is impacted by sea level rise, which threatens to overrun salt marshes, barrier islands, and other coastal habitats. The explosion of the Deepwater Horizon (DWH) oil drilling rig in 2010 added insult to injury, killing wildlife, damaging coastal habitats, and crippling local economies and communities to a degree that we still don’t fully understand. Indeed, the Deepwater Horizon oil disaster is a pivotal moment for the region. The spill began on April 20, 2010 when BP’s Macondo well failed. The accident resulted in the deaths of 11 workers and injuries to 17 others. Oil and natural gas continuously blasted into the northern Gulf of Mexico for 87 days. At its maximum extent on June 19, 2010, oil covered over 15,300 square miles of the ocean, an area about 10 times the size of Rhode Island. Oil slicks fouled 1,300 miles of shoreline, including beaches, bays, estuaries, and marshes from eastern Texas to the Florida Panhandle. For a more complete assessment of DWH impacts, see Final Programmatic Damage Assessment and Restoration Plan. After several years of complex legal actions, BP and the other responsible parties agreed to pay around $16.67 billion to restore the natural resources, recreational opportunities and economic activity that was lost due to the spill. This money is flowing through three main processes: the Natural Resource Damage Assessment (NRDA), the RESTORE Act, and the National Fish and Wildlife Foundation. 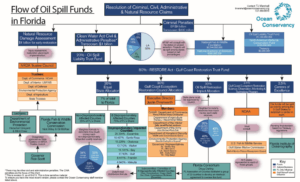 The Environmental Law Institute’s Gulf Program website provides a synopsis of these funding mechanisms and a status report on funding. A multi-billion dollar restoration effort across three funding processes operating across multiple states is a recipe for complexity; the Ocean Conservancy has mapped the funding process in each of the five states, and the complexity is easily apparent. Despite the complexity emerging out of the DWH oil disaster settlements, the resulting funds represented an opportunity for a landscape-scale response to refocus the future trajectory of the entire region. With support from the national Land Trust Alliance (Alliance), the Partnership for Gulf Coast Land Conservation (the Gulf Partnership) was formed in 2010 to step into this opportunity and build the capacity of nonprofit land conservation organizations in the region as they geared up to help respond to the Deepwater Horizon oil spill disaster. Information on policy and funding opportunities specific to the Gulf Coast region. What the Gulf Partnership has done successfully over the past eight years is provide the necessary backbone leadership and coordination to enable the conservation community to ensure that landscape scale conservation is a key component of the Gulf restoration effort. animals). This has resulted in each of the three major oil spill restoration funding programs including conservation as a major goal in their restoration plans. In fact, more than $171 million oil spill restoration dollars have already been allocated for land acquisition projects through the end of 2018. Millions more are being spent on habitat stewardship on public and private lands. Increasing on the ground conservation: Building capacity for strategic action. The availability of funding for land conservation represented a huge opportunity—and another moment where backbone leadership and coordination was critical. 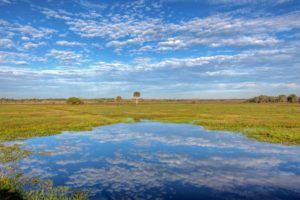 With more than 25 partner organizations pursuing land conservation projects throughout the Gulf of Mexico region, the potential existed for competing and fragmented responses. The Gulf Partnership though was able to bring together the diverse partners to express geospatial shared priorities, resulting in A Land Conservation Vision for the Gulf of Mexico Region: An Overview(2014). This report summarizes the common focal geographies among partners through maps and narratives, highlighting important community and resource assets that need protection across the entire region. With some dedicated funding and a shared regional vision providing a foundation for strategic collaboration, conservation organizations were well-positioned to proactively achieve conservation success on the ground. However, challenges remained. The Gulf restoration effort is primarily a state-led process that is multi-faceted and complex; there are many restoration needs and approaches. The conservation community needed to make their projects as competitive as possible by being able to demonstrate that there was a willing landowner, that the price would be fair and that there would be substantial ecosystem benefits to the conservation activities. Conservation organizations would need to be able to pay for a variety of up-front costs for due diligence before accessing funding to close conservation deals. Again, the Gulf Partnership’s capacity as the backbone leader and coordinator paid dividends. In 2014, the Gulf Partnership secured funding from the Texas-based Knobloch Family Foundation to launch a strategic matching grant program to provide funding to their partners for these critical due diligence tasks. The matching grant program has been a big success – over the past four years more than $485,000 in matching grants has been leveraged into more than $60 million in conservation funding and the permanent protection of more than 32,000 acres of fragile coastal habitat. Since 2010, the Gulf Partnership has served a convening and organizing role for land conservation in the Gulf of Mexico region. 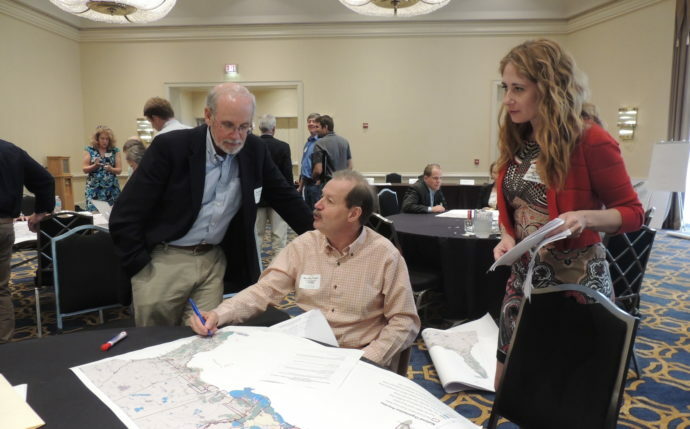 Although our core constituency has been the nonprofit land trust community, we have strengthened relationships with many allies in this work – landowners, state and federal agencies, researchers, and other community organizations. The DWH oil spill restoration process will continue for at least the next 10 – 15 years. The Gulf Partnership will be right there – continuing to advocate for landscape scale conservation as a key strategy to healing the Gulf of Mexico. But the DWH oil disaster is not the region’s only challenge. The region is facing increasing development pressures, land loss, and terrible impacts from intense rain events, stronger storms, fires and hurricanes. The Gulf Partnership is also working to identify how land conservation can help address flood hazards, climate change, and coastal community resilience. To find out more about the Gulf Partnership, contact our coordinators: Julia Weaver at [email protected] or Liz Barber at [email protected] or visit our website at www.gulfpartnership.org.